After you've cleared customs follow the signs to the "Airtrain". The Airtrain makes frequent stops everywhere around the airport: airline terminals, parking lots, hotel shuttle areas and rental car facilities. You need to take the train that stops at Jamaica Station. You won't have to wait long, it runs every 7 to 15 minutes. Traveling time from JFK's terminal 4 to Jamaica station is about 13 minutes. You pay upon arrival at Jamaica station. Upon arrival at Jamaica station you have to pay $ 5 (cash or credit) in order to get a ticket. Swipe it like you would a metrocard and exit. However, you might want to go for the special offer: $ 7,75 + $ 1 dollar (for the metrocard) will get you from JFK to Jamaica . This is the $5 you have to pay upon arrival + $ 2,75 for the onward travel to Manhattan. We say "go for it" and pick the one which you can top up later on. Now you're on your way to the subway. Also referred to as "train". Take the elevator all the way to the lowest platform. Google maps is a good way to find out which subway/train you need to take in order to reach your destination. We advice you to check that before you head towards New York. Find your train and make sure you're on the right side of the platform. Passing through the turnstiles can be a bit challenging. Make sure your shove your suitcase past or through before you swipe and make the turnstiles turn. It took us exactly 75 minutes to get from JFK to our hotel in the Lower East Side. The taxi would have taken us just as long. It would have cost 70 dollars. 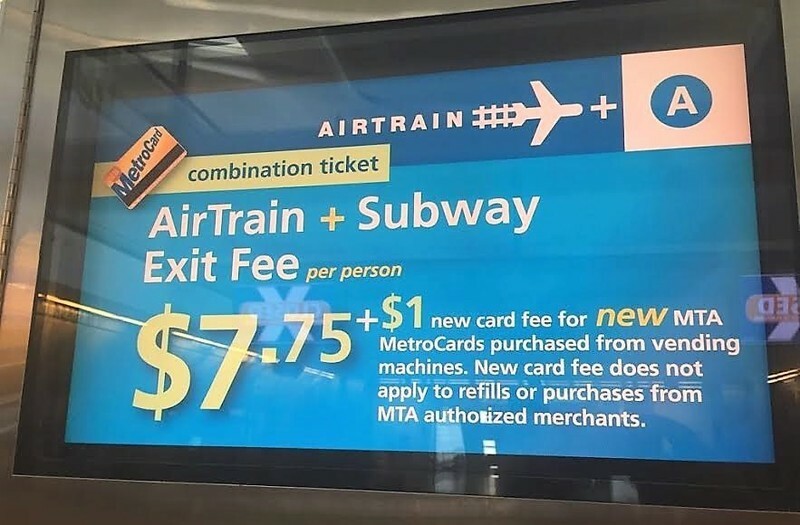 The airtrain cost $ 8,75.